Everyday when I wake up, I check my Facebook notifications to see if I have a message from you. I know it's only been a couple of months since we've first met but our 'relationship' has become a bit of an addiction. I think it first started with the chocolates. I mean, I thoroughly enjoyed all of the random brightly-coloured candy you kept dropping off but chocolate is definitely the way to this girl's heart. But now, my heart is breaking. You see, we've had so much fun over the last little while and I will never regret all those 146 times we've spent together. But I feel like we are now stuck in an explosive relationship. I try to give you what you want over and over again but you just blow up in my face. And I'm not sure I can handle it anymore. I feel like a constant failure and it's just not fair. I know many of my friends are doing it, so many of whom are married and have kids just like me. And I see them spending time with you as well, when we all know we should be spending time with the kids or tending to some chore or other. I have even seen a number of my friends who have managed to get past the explosive stage of their relationship with you and have invested much time and dedication into making it work. I'm just not sure I'm that type of person. 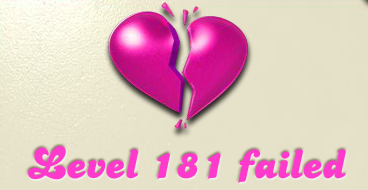 I really don't think I will ever get past level 147 and a part of me is truly saddened by it. Perhaps one day things will just click and we can bring back some of that momentum we once enjoyed. Until then, I feel it's best if we part ways and take a little break. So I finally decided to take it to the next level with you and I feel completely and utterly disgusted with myself that I actually paid you $0.99 to get there. What on earth was I thinking? Now you are playing hard to get and once again my heart is broken. LOL I am pretty sure that level gave me an eye twitch. I'm happy to say that while I still enjoy a game I no longer have the obsessive need to play on all my devices to maximize the # of lives I have. Really? You mean that's even possible? I think I have played level 147 at least 147 times and I'm just about ready to throw in the towel. I'm also stuck on 147 but it wouldn't be the first time it's taken me weeks to get past a level. You, too? I am having such a hard time and I am blaming those timer bombs. Such a nuisance! Believe it or not, it's NOT the timer bombs, though I really hate those. I just can't those last jelly blocks! For me, more often than not, it's the timer bombs. I come so close to getting rid of all the jelly with only 4,3 or 2 left and I either run out of moves or a bomb goes off. I am so glad I have never started playing this! Oh boy! I just got to that level yesterday. I am also a bomb hater! I am beyond fed up now. I think I'm going to have remove this app ASAP. My 5 year-old is beginning to get fixated with computer games. I am trying to keep her grounded by reminding her that if she is getting upset during a game, then it's not fun anymore. I've told her that a game is for fun, so if she's shouting every time she dies, she must stop playing. Sometimes I play with her, and it can get tense. Hahaha! Thanks for visiting and leaving a comment on Amanda's Books and More. I fear that my kids would be the same. Which is why I have to limit their use of the Wii. My son has already had moments where he shouts in anger. Now I encourage him to play less competitive games such as Just Dance 4. Such a great workout! I am such a newbie - only on level 38! My son loves it too, but boy do I get annoyed when he uses up my lives! I sometimes use up all five lives on my iPhone and then if I haven't passed the level, I log onto Facebook on my computer where I will have a full set of five lives! I don't know whether to send you congratulations on taking it to the next level or give you a big big hug. I'm stuck on 167 and I wake up every morning thinking, 'maybe today's the day'. OMG So you totally get it! I don't know why I ever let myself get sucked into it. It's pure madness, I tell you. MADNESS!